On June 12th 2009 the Okanagan Mustangs and Fords car club had a cruise up to 3 Valley Gap in Revelstoke BC. After a great day of cruising we arrive at 3 Valley Gap Chateau for an evening of entertainment. 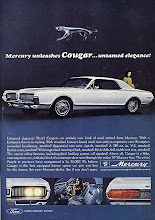 Upon arrival I ran into Robert Nowland and his Rocky Mountain Life Insurance 1969 Mercury Cougar. This was obviously destiny as I had just read about the Rocky Mountain Purple Cougars in April of 2009. Linda Beauregard/Jackson was on the trip with her 1971 Cougar so we took the opportunity to take pictures of this rare occasion. 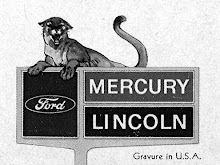 In 1969 the Rocky Mountain Life Insurance of Alberta, special ordered cars for their top salesmen. In all 98 cars were ordered with special WT9083 (purple) paint. White vinyl roof, power steering tilt and tilt away wheel, 351 W 4 barrel and other special options. 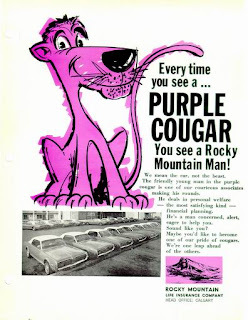 In 1970 when the company was dissolved, these purple and white 1969 Cougar XR7’s were shipped from Universal in Calgary for dealers to sell. Vehicle ordered with the following options. White vinyl roof, immersion heater, FMX Cruise-O-Matic Transmission, E78X14 Tires, White sidewall tires, Power front Disc Brakes, Power steering, Tilt & tilt away steering wheel, AM/8-Track Stereo Radio, Tinted glass complete, Deluxe Belts/Warning Light, Heavy Duty Battery, Door Edge Guards, Wire Wheel Covers & Front Bumper Guards. Serial numbers start with 9F93M followed by the 5 number sequential serial numbers, Engine is 351-4V Winsor. Interior is Code FA - White leather Bucket Seats W/ Black Appointments. DSO is a 6 character code starting with A6 and the Special order number.